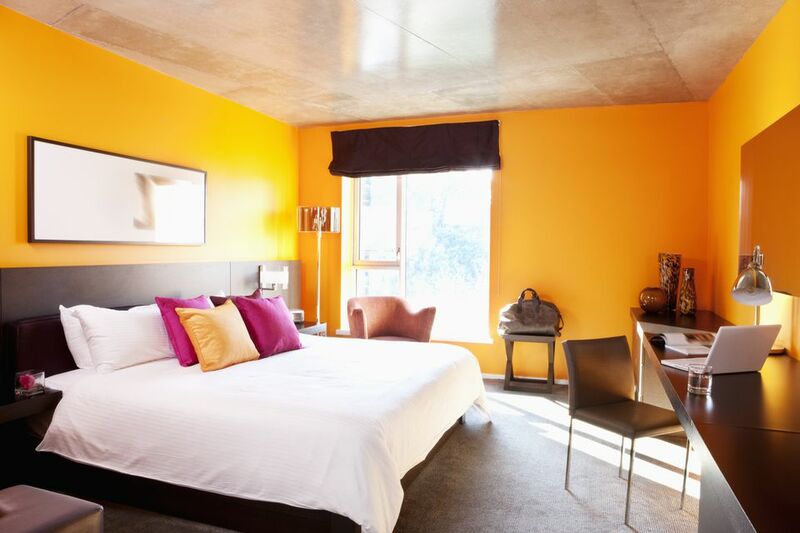 Orange is a delicious fruit and a vibrant, fun color option for bedrooms! This Indian summer color choice is often used for fall holiday decorations, such as Halloween and Thanksgiving. Orange, believe-it-or-not, is a popular color used in many bedroom decorating styles, such as modern, traditional, and eclectic bedrooms. 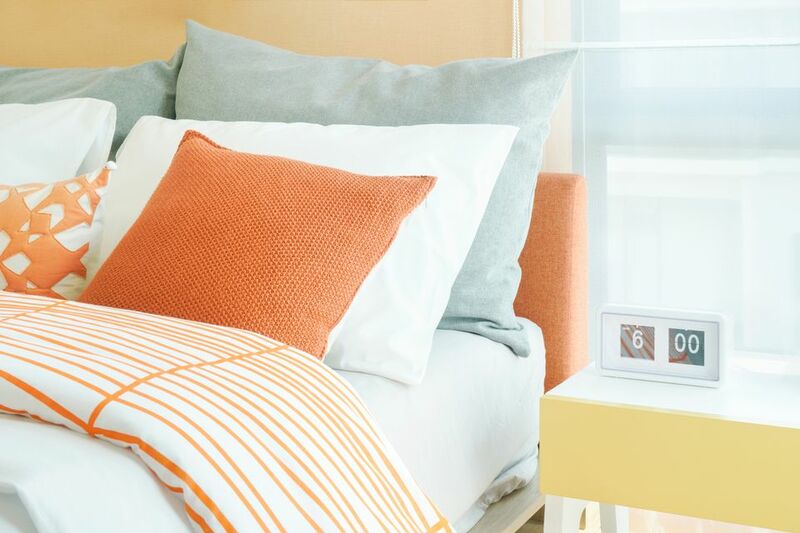 Even though this is an exciting, warm color alternative, it can be unforgiving if used incorrectly; here are some great tips and ideas on how to incorporate the color orange in your bedroom. Orange and grey is a great color combination for bedrooms. Whether you use grey as your base color with accents of orange or the other way around; this combination always works well together, especially for contemporary and modern bedrooms. If you want more of a dramatic color contrast use a cool grey hue; for a more subtle look find a grey hue with warm undertones. Combining warm hues together—such as orange and red or orange and pink—can be great alternatives for a tween or teen bedroom idea. These color combinations create a wonderful contrast and lively color options for these types of contemporary bedrooms. With the right pieces of furniture, accents, and artwork this color duo works well as long as you remember to use a neutral color to balance out the design—like white, soft browns, or beige—otherwise the room will begin to look too busy and chaotic! This lovely eclectic bedroom designed by Kimball Starr Interior Design is a perfect example of an all-orange bedroom idea. This design is well thought out using soft browns, white, patterns, and different shades of orange to create a complete and well-balanced color scheme. A great idea that you can create by incorporating a few simple pieces to your bedroom, such as the area rug, accent pillows, and bedding. This traditional bedroom is a wonderful example of how to incorporate soft, pastel shades of orange into a bedroom. This gorgeous bedding, throw, and window treatment provides soothing, subtle hints of orange that is combined with beige, deep browns, and white trim to maintain harmony. Using several textures, patterns, and decor is another great idea for creating a beautiful orange color scheme for a bedroom. Such as this dynamic eclectic bedroom designed by Domicile Interior Design that uses several textures, patterns, and accents from contemporary, traditional, and Asian inspired pieces to create a fun design and color scheme. Color complements are wonderful color schemes for bedrooms because they create a stunning contrast; which can be bold—such as this modern bedroom that uses dark blue, red, and vibrant orange—or subtle by using pastel shades. This color scheme is always a great way to add some fun color and interest to a bedroom; the key to a successful design when using color complements is to incorporate a neutral base or accent color—like white, black, brown, or grey. Using brown and orange together can be a bit tricky because if too much is used or incorporated in your design, your room will begin to resemble fall holiday décor or a bad 1970’s doily. The trick is to either use these color combinations as accents within bed pillows, bedding, artwork, and furniture or find a nice neutral color to balance out the design such as white, beige, grey, or blue. A well thought out color scheme and design will always turn out well if planned accordingly, like this fabulous bedroom designed by B Fein Interior Design that not only uses brown accents but also many shades of grey and orange. A great way to add orange into your bedroom is to create an accent wall behind the bed with wallpaper or a decorative paint technique. This idea is always a delightful way to add any color to a bedroom as well as a great focal point. If you want to add orange on an accent wall but do not have the time, or patience to add wallpaper or a faux paint technique, using a solid orange paint color is always the best solution. It will add a wonderful focal point to your bedroom and give the room depth making a small room appear larger. Besides paint, wallpaper, accent pillows, bedding, window treatments, and artwork, another alternative to add orange to your bedroom is to use furniture. This can be done with a headboard, chair, bench, end tables, dresser, or wardrobe that is custom-made to your specifications. This alternative can be quite expensive but if you’re a devoted do-it-yourselfer then you can find these pieces at estate sales, flea markets, or ​Craigslist to reupholster and refurbish while keeping within a reasonable budget.